This week I am excited to have some blogging friends guest posting on the site while I am continuing my travels in Europe. So who better than a fellow traveler who also has some of the best recipes I know?? Yep, I am thrilled to welcome Kristin from Iowa Girl Eats to the site! Her beautiful blog has long been one of my favorites, filled with amazing recipes with step-by-step photos, gorgeous travel pics and beyond. And what’s more, Kristin could not be more fun and encouraging behind the scenes. So be sure to stop by her site, and get ready for this deliciousness below! Psst! 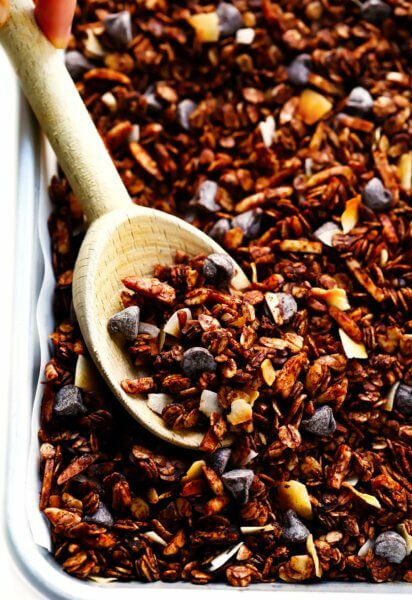 Hey it’s me, Kristin, from Iowa Girl Eats, where I share mostly healthy, in-season recipes with the occasional decadent dessert thrown in! Guess what? It’s decadent dessert time – whee! With only a few days left until the New Year, and our annual resolution to eat a little bit healthier and lighter, what say you we indulge one last time – on Chocolate Peanut Butter Sheet Cake, no less? 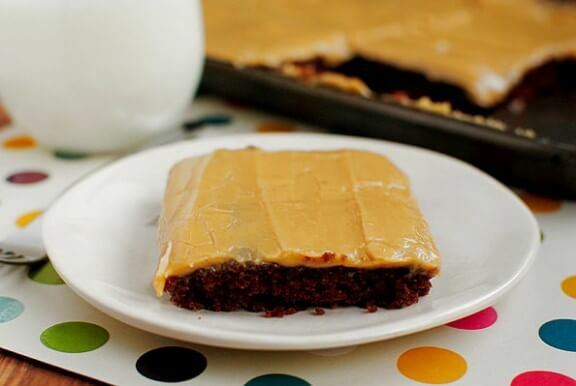 The recipe for Chocolate Peanut Butter Sheet Cake is my lovely Aunt Mary’s, who comes from a long line of incredible Italian cooks. From homemade sausages and pasta, to intricate cookies and cake, I’ve never had a dish of hers that I didn’t immediately request the recipe for after devouring every last drop. Her ridiculously moist chocolate sheet cake slathered with luscious peanut butter icing when it’s still warm from the oven tastes like a giant Reese’s Peanut Butter Cup. Enjoy with a big glass of cold milk – while you still can! 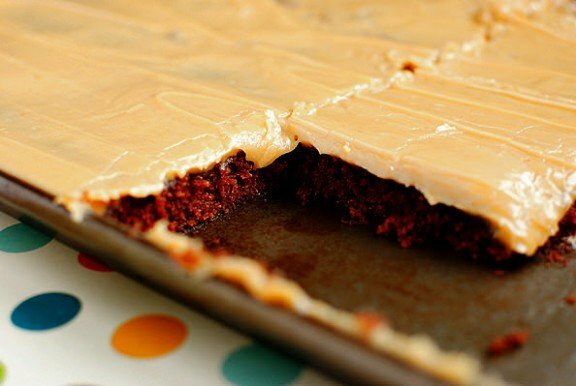 Chocolate Sheet Cake with Peanut Butter Icing is my Aunt Mary’s recipe. So rich and decadent that it comes with a warning – make sure you’ve got some milk on hand! Preheat oven to 350 degrees. 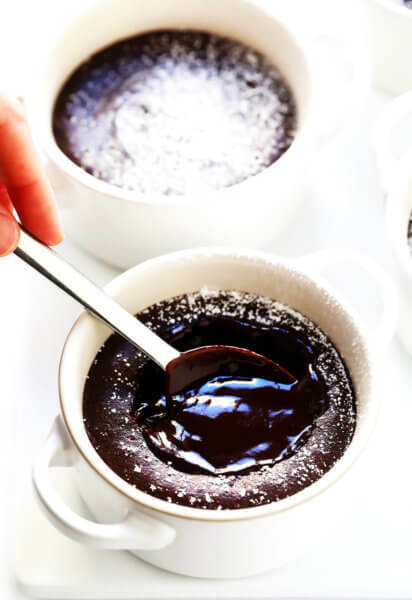 Combine butter, water, and cocoa powder in a large saucepan then bring to a boil. Remove from heat then set aside to cool slightly. Whisk together flour, sugar, baking soda, and salt in a large bowl then create a well in the center. Add cocoa mixture then whisk until smooth. Add sour cream then whisk until smooth. Pour cake batter into a non-stick sprayed baking sheet (I used a 17×12) or jelly roll pan, then spread evenly. Bake for 15-18 minutes, or until a toothpick inserted into the center comes out clean. Whisk together powdered sugar, milk, melted butter, and vanilla in a large bowl. Add peanut butter then whisk to combine. Microwave for 30 seconds then stir if too thick. Pour over warm cake then spread evenly. Allow to cool then slice and serve. I looove a good sheet cake. So easy and so good! Two of my favorite bloggers teaming-up, LOVE it! WOW, this looks awesome! Sheet cake is like a religion here in TX, so I’ll have to give this a go. :) Great job, Kristin! that looks wonderful! I totally have to make it. This sheet cake is pretty much my idea of perfection. 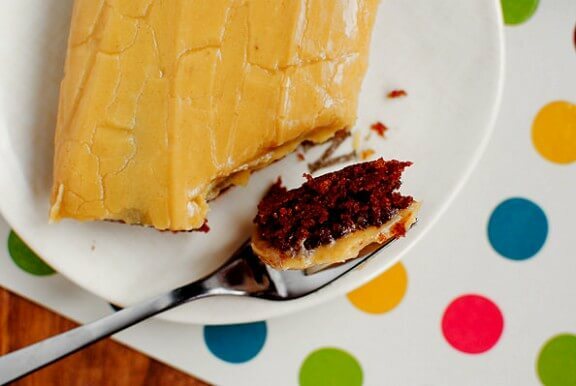 Nothing is better than chocolate cake with peanut butter icing. I’ll definitely be making this soon :). I’m in for a generous slice with a big glass of milk! Yum!! I love guest posts, it’s always so interesting. I like the idea of a your cake. Chocolate, peanut butter, what not to love. This looks so good!! I love chocolate & peanut butter together!! Making this for my birthday today after loving it when I made it a couple weeks ago. Happy Birthday to me! I just made this cake this afternoon! 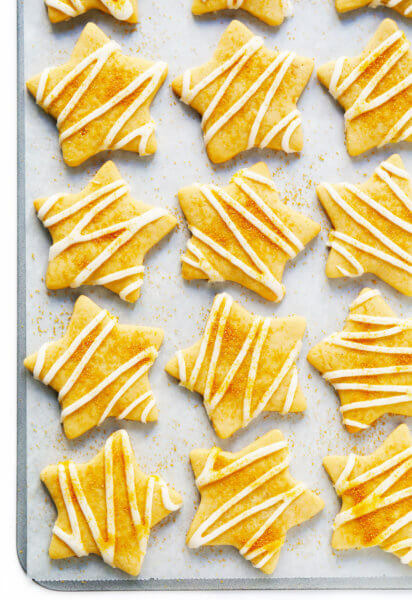 The frosting is so decadent and tastes like peanut butter fudge. I cannot wait to try the cake itself tomorrow! It’s my mothers birthday!